Bask in the luxurious comforts of the Marsical Patio Lounger as you indulge in a good book or enjoy the warmth of the sun. 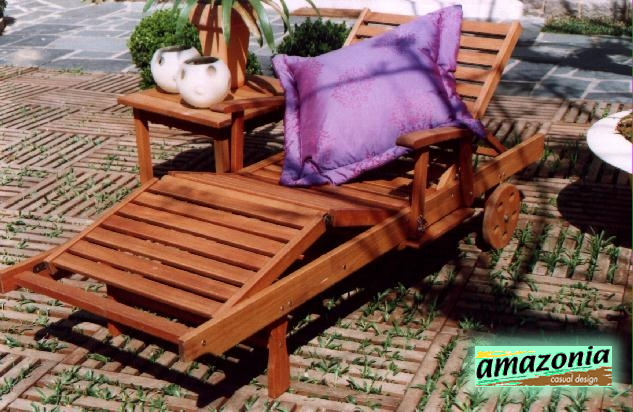 The Marsical Lounger is portable and easy to move, thanks to two rubber coated wheels. In addition, the Lounger has an adjustable leg rest and adjustable back rest which can be situated in 4 different positions. A convenient slide out shelf under the seat is big enough to hold your drink, glasses, book, or anything you need close at hand when relaxing. Some assembly is required. Cushions shown are not included. 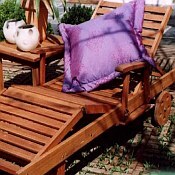 The Marsical Patio Lounger is constructed from durable Eucalyptus wood and stainless steel hardware. Eucalyptus wood is easy to maintain and is naturally resistant to rot and insect infestation. Additionally, each piece is finished with Polisten, a Brazilian product that provides even more protection against the damages of moisture and insects, extending the life of the furniture.